Michael A. Carrier is Distinguished Professor at Rutgers Law School. He is a leading authority in antitrust and intellectual property law with expertise in the pharmaceutical and high-technology industries. Professor Carrier is the author of Innovation for the 21st Century: Harnessing the Power of Intellectual Property and Antitrust Law and the editor of Critical Concepts in Intellectual Property Law: Competition. He has written more than 90 book chapters and law review articles in leading journals including Stanford, Michigan, Penn, Duke, Vanderbilt, Minnesota, Iowa, and Notre Dame, as well as online journals at Harvard, Yale, Stanford, Michigan, NYU, Penn, Northwestern, and Minnesota. Professor Carrier’s scholarship has been cited in numerous court opinions, including in the U.S. Supreme Court, and he has written and submitted amicus briefs on behalf of hundreds of professors in the U.S. and California Supreme Courts and federal appellate courts. Professor Carrier has testified before the Senate Judiciary Committee and is frequently quoted in the national media. He is a member of the Board of Advisors of the American Antitrust Institute, is a past chair of the Executive Committee of the AALS antitrust section, and served on the 2016 ABA Antitrust Section's Presidential Transition Task Force. 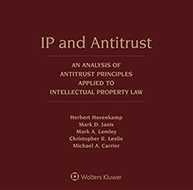 Confidently draft and review intellectual property licensing agreements with IP and Antitrust: An Analysis of Antitrust Principles Applied to Intellectual Property Law. Subscribe today.